There are numerous benefits to daily meditation. Here's how to make it part of your life once and for all. Setting up your meditation space is one of the best ways to ensure you take your regularly scheduled me-time for daily meditation. Did you know that meditating can give you superpowers? Okay, not really, but the benefits of meditation are plentiful. Daily meditation promotes focus, a feeling of well-being, mental clarity, sleep, and even keeps leukocyte telomeres from shrinking. There are dozens of scientific studies on the benefits of meditating. So why is it so hard for people to take 15 minutes out of their day to be mindful? Being mindful means focusing on the moment instead of thinking about what could happen at any point in the future. The problem is most of us are too busy anticipating the next few minutes and further into the future to be still enough to appreciate each moment. Here are 7 ways to include meditation as part of your daily life. It’s easier to stick to an action when it’s part of your daily schedule. Block out a standing section of time on your calendar each day and make sure you keep it. Like any other appointment or meeting, this time is important. Many people prefer early morning meditation as they’re less likely to be interrupted or get distracted by other things. Meditation before bed can be part of an evening routine. It can be especially helpful if you have trouble falling asleep. A meditation space is important. Your meditation space should be a place you want to return to again and again. When you have a place you love to be, you’re more likely to go there regularly. Your space can as minimalist or as an elaborately adorned as you like as long as it makes you feel relaxed and brings a sense of calm. It can be as small as a closet, or a corner in a room that allows you alone time. If you set up a corner, a privacy screen or a make-shift curtain will help to seclude you from external stimuli like kids, pets, and the distraction of clutter around the house. You can also find an outdoor space that soothes you if you prefer. The goal is to make you feel as good as possible while you’re meditating. If you’re lucky enough to have an entire room to dedicate the meditation, you can incorporate feng shui, colors, lighting, and mood enhancing elements to make your meditation space your favorite room in the house. There are a few tools that will help make meditating more enjoyable. Malas are particularly helpful tools for mantras and breathwork. Comfortable seating and proper alignment are the most important factors for being able to sit for an extended period without discomfort. If you’re uncomfortable you’ll be less likely to continue practicing meditation. That’s where meditation cushions come in. A good meditation cushion can help you forget you’re sitting on the floor, and help you let go of the things that clutter your mind. They will also alleviate any undue stress on your back and help you get into proper alignment. 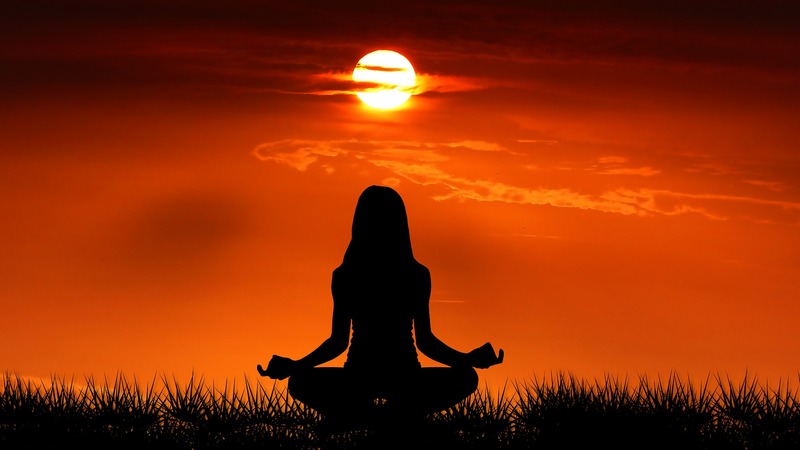 Meditation music is another tool you can use to help focus on the moment. There may be times when your regularly scheduled meditation will be preempted . In such times, something that reminds you to meditate at some point during the day can help. Things like malas, a strategically placed Sanskrit om, or the sound of a singing bowl can be used as a reminder to do your daily meditation. You can even set a reminder on your phone if you prefer. There are several meditation apps that send reminder notifications to your phone. These apps are also helpful meditation tools, as they have guided meditation options to guide you through your meditation sessions. Anything that gets you to take a few minutes of me-time to breath and be present can work as a reminder. Sometimes, we enter into meditation with lofty expectations. We might assume we’ll be calmer after the first session, or maybe we think we’ll be able to shut out our inner monologue after a week of daily meditation. It’s not that simple. The truth is, meditation is different for everyone. And the goal is not to shut off all thoughts, but rather to be in the moment by focusing on our breath and bodies. When we expect certain things it’s inevitable we’ll be let down and the potential to quit becomes greater. The best way to go into meditation is with an open mind and a willingness to it without expecting a thing. When you have someone to keep you accountable, you’re more likely to follow through with a plan. If someone in your life already meditates, they may help you to strengthen your meditation muscles, so to speak. Depending on how long they’ve been practicing they might help you to recognize where you’e holding tension, how shallow or deep you’re breathing and how to correct your posture. If you choose someone who’s also new to meditation you won’t feel alone in your journey. It can be frustrating when you first begin to meditate because you don’t know what to do with your hands, thoughts may be running through your head at 100 miles an hour, and you’re may even feel self conscious. Your partner will likely share all of those emotions. There might be times when you want to throw in the towel on your meditation practice. This may relate back to expectations, or maybe you’re just not feeling it. You are not alone. Many people quit on their meditation practices for various reasons. Some people simply forget to take a few minutes to themselves, and forget about meditation altogether. Others just stop because they don’t think they are benefitting from daily mindfulness. The key is to remember you get out of it what you put in. If you go in with negativity, you are likely to have a negative experience. The same can be said for positivity. Just know there are no rules to meditation. You can chant, you can sit quietly, you can use music, incense or other sensory stimiluting tools to help put you in a relaxed headspace. Your daily meditation practice is yours to design however you want. Just keep at it. If you’ve got a daily meditation ritual or tips you’d like to share, leave it in the comments section. Brandi is a thinker and a dreamer. She's a writer with a passion for story-telling.